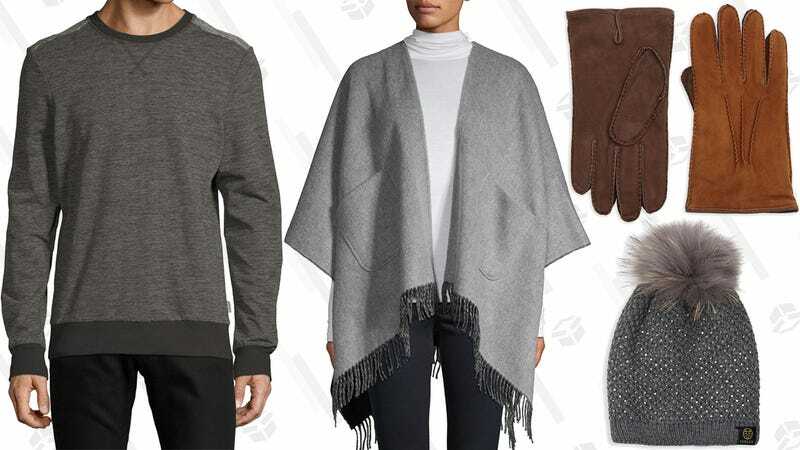 Coziness and warmth are high priorities when it comes to shopping for winter apparel — a fact that Saks Off 5th clearly understands well, considering they’re taking 50% off select “warm & cozy” styles for men and women with promo code COZY50. Now, it’s important to note that several of the items included in this sale were pretty pricey to begin with (especially the offerings from designer brands like Giorgio Armani, Givenchy, St. John, and Valentino) so the discount doesn’t seem like it will do very much — unless of course, you’re in the market for high-end. But never fear: There are plenty of high-quality, not-so-high fashion sweaters, hats, scarves, and gloves available as well to help warm you up.